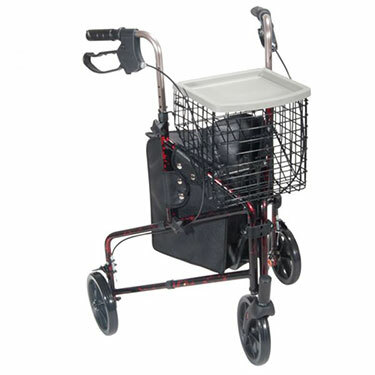 The Rollator comes with a basket that folds flat and a unique frame design that allows it to be folded in two directions, making it compact for storage and transport. The Drive is very tippy. Father wasn't sure he would like the tray and basket feature. Now he uses it all the time! Cons:could not put any pressure on handles. It is quite useful and handy. It can be transported easily. It is a good help for movement in and around house, but it is difficulty to move on rough surface. Pros:Good light weight and can be easily transported. It can be easily placed in the back part of the car. Cons:It was not very easy to assemble. Even now, after struggling I cannot install the basket. I will be happy to receive some help. Cons:if too much weight is placed on one side can tip up. people do not always use it with lock position. Handle Height: 31" - 33",34" - 36",37" - 39"